But we are speaking of astrology, and Dr. Tyson knows that astrologers use celestial longitudes. He knows (or should know) that the Sun enters the longitudes of Scorpius and Ophiuchus at the same time and remains in those longitudes for the same length of time. 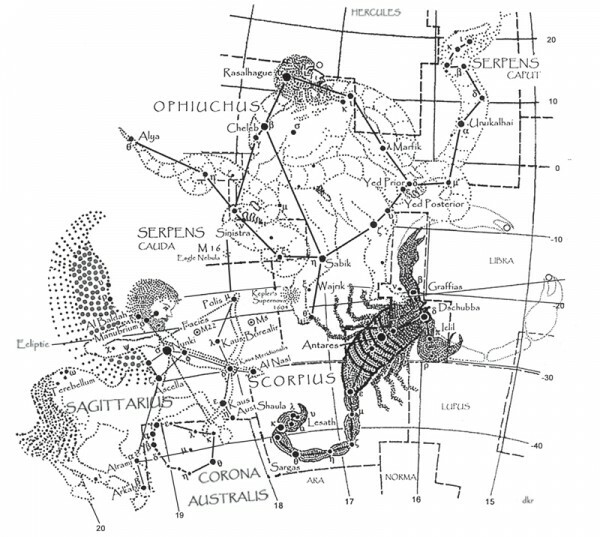 It is true that the ecliptic runs through part of Ophiuchus, thus rightly making him part of the zodiac; however, the span of Ophiuchus the Serpent-Bearer, in celestial longitude, matches that of the Scorpion, so he cannot be called a “thirteenth sign”! In actuality, the eighth zodiacal constellation should be called Scorpius/ Ophiuchus. Indeed, the two figures actually contact each other, as the left foot of Ophiuchus treads upon the Scorpion (according to tradition) in order to crush it. (See Figure 1) It is this overlap that creates a problem and makes it seem as though Ophiuchus’s allotment of degrees exceeds the Scorpion’s… Read the complete article here.